Total is one of the few multipurpose themes that takes developers’ needs into account. All the hooks, snippets, and filters developers look for are built it. Porto is a top-of-the-line multipurpose theme that places extra emphasis on eCommerce website building features. This responsive theme is easy to use, highly customizable, and free. You’ll be provided with 25 unique homepage layouts and skins (with more to come), plenty of useful widgets, unlimited colors, powerful page options, and a useful selection of portfolio and blog templates. Virtual Composer (with 33+ special elements) is Porto’s page builder of choice. You’ll be able to choose from a nice selection of shop pages, there’s a Shop Catalog Mode, and there are 16 shop demo variations that feature everything from fashion and fashion accessories to furniture and electronics. You can of course customize these pages and demos to market any product you like (with Ajax filtering in the shop and product archive pages). Versatility is the order of the day with TheGem. This powerful theme has everything going for it: smart tools, professionally-designed concepts, creative page templates (including an excellent selection of blog and portfolio layouts), shortcodes, widgets, and more. TheGem will help you build an impressive, high-performance website in minutes without touching a line of code. It’s a perfect choice for a business of any size or purpose as well as online shops that you can bring to life in minutes. The real estate industry is one area in which there’s no such thing as a shortage of potential clients; many of which can be quite demanding. Houzez has just the right features and provides precisely the functionality that on-the-go real estate agents are looking for to best serve their customers. This WordPress theme has everything from Google Geolocation and radius search capabilities to unlimited listings templates and a realtor’s Membership system. The best way to see what Uncode offers is to visit the website and browse the showcase of creative websites this theme’s users have produced. You’re almost guaranteed to come across a concept or two you’ll find of particular interest and be inspired to make use of Uncode’s many features to create websites of your own that will stand out in any crowd. If creating an online shop is on your list, you’ll find the WooCommerce single product features especially useful. You’ll enjoy working with Kallyas. This multipurpose WordPress theme is super-fast, responsive, and SEO and WPML ready. 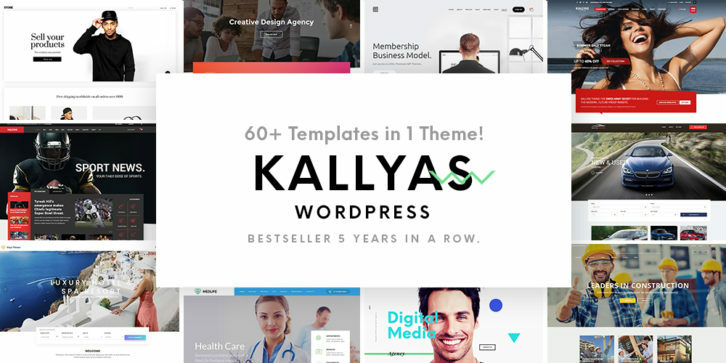 Kallyas’ package includes over 60 pre-made website templates, the Zion visual page builder, and more than 150 carefully-crafted design elements. You get live chat support and there are more than 150 video tutorials to help you along the way. 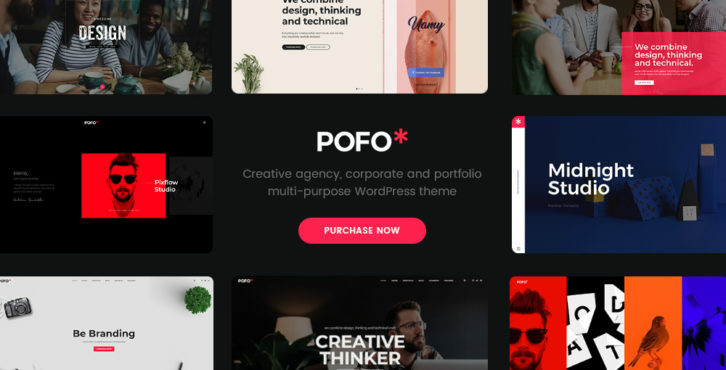 Pofo is a modern, creative theme that is just what is needed for creative clients. As its name implies, this theme is an excellent choice for any client that relies heavily on a well-designed portfolio to bring in business. Pofo is blazing fast, it’s SEO optimized, and makes maximum use of custom shortcodes, the WordPress Customizer, and the popular Visual Composer page builder/editor. You can build any site your heart desires with Themify Ultra. This multipurpose theme features an impressive array of pre-made demo sites and skins and a useful selection of pre-designed page, header and footer, and post layouts. A free portfolio post type plugin also comes with the package, together with WooCommerce support. Layers is a multipurpose WordPress theme that introduces an innovative pricing strategy. You won’t be paying for what you have no use for. The default theme, which has all the tools needed, includes a library of preset page layouts, to build a beautiful, high-performance site at no charge. What you pay for is any of the extensions Layers offers that you might want to use such as a Pro version with more design options. Stormyday is just the right choice for those wanting to make a statement. This new WordPress blog theme features a one-click live demo install, a brand-new page builder that splits pages into header, footer, and body sections, unlimited colors, plus it gives you complete freedom to design unique page layouts anyway you see fit thanks to an extensive variety of shortcode and block combinations. That’s just a start; we suggest you visit the website to see for yourself. This clean, modern, and thoroughly customizable multipurpose theme will serve you well whether your website creations are allowed to be somewhat typical, or are designed to satisfy a client whose needs are quite out of the ordinary. Fildisi is the ideal choice for creative designers who seek out equally creative customers such as photographers, artists, bloggers, and sellers of handcrafted products. To call Movedo creative might be an understatement. This multipurpose theme has some truly awesome special features. They include, unique clipping animations, ultra-dynamic parallax effects, crispy moldable typography, and a few other goodies designed to free you from the tyranny of website sameness. Movedo adjusts to your creative instincts; not the other way around. Give Movedo a try and enjoy the experience. XStore takes you well beyond designing and delivering “just another online store.” With the help of this minimalist theme, you can produce a design that positively rocks. Start with any of the 70+ good-to-go shops, take full advantage of this theme’s cool selection of design features and elements, and in no time at all you’ll have a product anyone will be thrilled to own. Check out the showcase on the XStore website to see what other customers have accomplished. You can build anything with this free multipurpose WordPress theme, with a little assistance from Elementor’s 50+ free templates, the free OrbitFox plugin, and the cool selection of widgets. Hestia was modeled after and built around material design principles. You’ll find this multipurpose theme’s single page layout makes navigation particularly easy, and easy for your website users as well. 15 themes to choose from might seem like a rather lengthy “short list”. This is especially when you can’t really make a bad choice. You should have little trouble in whittling the list down to 3 or 4 candidates. Then, just choose the one that fits you the best. Several of these themes are free or “Lite” versions, and as such are always worth a try. As for the rest, all are affordable, and each one is a worthwhile investment.